After participating in the exciting ACT-W National Conference 2018 in Phoenix, LumApps continues to work with organizations to create equal opportunities for women in tech. As our latest endeavor, we’re joining Austin Women in Technology to get involved in the local scene. Austin Women in Technology (AWT) plays a crucial part in the thriving Austin technology scene, specifically, fostering a friendly networking and growing environment for professional women in tech. Founded by trailblazing women, AWT has been supporting passionate women and building a visible community since 2000. Visit the AWT website for more information. As a newcomer to the city, LumApps seeks to grow name recognition and visibility among the Austin tech community. LumApps Gold Sponsorship means we’re officially recognized as AWT sponsors during events and on the organization’s website. A number of our team members will join the Austin chapter, and will then attend events during the year such as Intelligent Conversations with Women. AWT provides a great platform for LumApps to create awareness and recruiting opportunities. Stay on the lookout for LumApps in various AWT communications channels throughout the year, and for an exclusive presentation of our social intranet solution during an AWT event. Our privileged contact at AWT is Andie Stafford, Sponsorship Director for AWT. We believe it’s important to build a well-rounded company, by making sure women join all of our teams in LumApps. As of 2018, we’re proud to say that women bring their expertise to Sales, Engineering, Pre-Sales Engineering, Customer Success Management, Marketing and Administration. 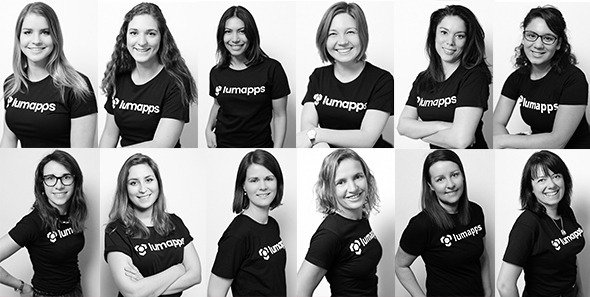 Here are a just a few of our LumApps women!